looked at their beautiful faces.I knew some day this would be the breed for me. 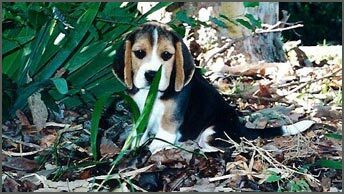 for a pet but I did want a beagle of quality like I had seen in the show rings. any time. After a few phone conversations, she placed me on her waiting list, at the very bottom! Penny had persuaded the other families to take other puppies, and saved the pick puppy for us. whiney puppy got used to his home. And we finally got some sleep. we were off to the show and the rest is history!